Michelle Alexander blames Hillary Clinton for mass incarceration. She shouldn’t. The 1994 crime bill was wrongheaded and draconian. But it didn’t cause the explosion in the prison population. It’s not their fault. Above the Clintons are pictured on April 29, 1994, in Washington, D.C.
Hillary Clinton’s record on criminal justice has dogged her throughout the 2016 campaign, thanks in large part to a federal crime bill that she vocally supported when her husband signed it into law in 1994. The law contained many separate provisions, but its overall thrust was to make criminal penalties harsher and to make the justice system less forgiving. Although Clinton has said on the trail that the law went too far and that she now wants to make the criminal justice system less punitive, critics have pointed to her support for the ’94 law as evidence that she is, at heart, a believer in tough-on-crime policies that disproportionately affect minorities. This week, an essay in the Nation written by Michelle Alexander stated that Bill and Hillary Clinton should be held responsible for what we now call our mass incarceration problem, with an astonishing 1.56 million people currently serving time in state and federal prisons. As champions of a law that resulted in billions being spent on “constructing a ﻿vast new penal system” that has ravaged black communities, Alexander argued, the Clintons are not deserving of votes from black Americans. The message carries a great deal of weight coming from Alexander, whose 2010 book The New Jim Crow: Mass Incarceration in the Age of Colorblindness has proved enormously influential in shaping the national conversation around the need for prison reform. Alexander’s essay reverberated widely, and it would be surprising if Clinton and Bernie Sanders were not asked about it at Thursday night’s Democratic debate. But how much did Clinton-era policies on criminal justice actually contribute to mass incarceration? Some experts say their impact has been massively overstated—and that the 1994 bill in particular had much less of an effect on the prison population than Clinton’s detractors would have it. One expert who is skeptical of the 1994 bill’s influence is John Pfaff, a professor at Fordham University School of Law who studies prison policy from an empirical perspective. I called Pfaff to discuss the Alexander article, and the degree to which Hillary Clinton can be held to account for mass incarceration. Our conversation has been edited and condensed for clarity. Neyfakh: According to the Bureau of Justice Statistics, the combined state and federal prison population in the U.S. went from 882,500 at the end of 1992, when Bill Clinton was elected, to 1,394,231 at the end of 2000, when he left office. 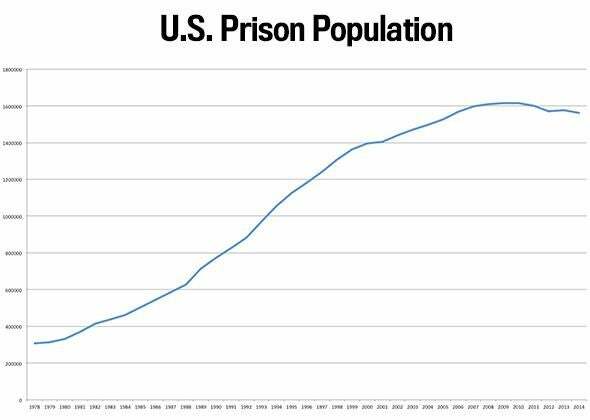 Referring to these numbers, Michelle Alexander opens her argument by saying Bill Clinton “presided over the largest increase in federal and state prison inmates of any president in American history.” Is that true? Pfaff: It’s technically true, in that it’s true that during Clinton’s years in office, more total people were added to U.S. prisons than during any other president’s administration. But the U.S. prison population had been growing steadily for almost 20 years before Clinton came into office, and it didn’t seem to grow any faster during his presidency. No. In fact, what you see in the prison population is a steady upward trend from 1974 till around 2000, at which point prison growth starts to plateau a bit. I have a hard time seeing it. The percent of people in prison on drug charges nationwide peaked in 1991. And since 1991, it has more or less steadily declined. Now, it’s true that the total number of people in prison on drug charges went up, but the whole prison population was going up along with it. The rate of growth for drug offenders in prison actually slowed down during the Clinton years; it didn’t speed up. Between 1980 and 1990, a third of all state prison growth was due to more drug offenders being sent to prison. During that period, the total number of state drug offenders rose from 19,000 to 149,000. Between 1990 and 2009—so, two decades, rather than just one decade—the number went from 149,000 to 242,000. Those are all state prison numbers. What about the federal system? The number of federal drug prisoners did go up: Between 1992 and 2000, the number of federal drug inmates rose from around 43,000 to just under 75,000. To put that in perspective, the total U.S. prison population grew by over 511,000 during that time. The increase in federal drug inmates was less than 6 percent of that total. But that leads to my other problem with saying Clinton “presided over” the prison growth: I think it gives him too much agency. It’s true that Clinton had some control over the federal system, but he had almost none over the states, and almost all the growth in prison populations during his two terms occurred in the states—87 percent of the increase, if only because most prisoners are held in state prisons. So as a strictly chronological matter, yes, it is true that the Clinton years saw the single greatest increase in the number of U.S. prison inmates compared to any other presidency. What that implies about his centrality to that growth—that’s where I have a much harder time. You could also argue that by the end of the Clinton administration, I was older than I was when he began, but no one would say that Clinton “presided over” my getting older. But what about the 1994 crime bill that Bill Clinton signed and Hillary Clinton championed? That was a huge and consequential law, wasn’t it? The key provisions were that it created a lot more federal crimes, it expanded the scope of the federal death penalty, and it expanded the scope of the federal three strikes laws. Those get a lot of attention, but again, it’s important to realize they only apply to the federal system, and that’s a very narrow slice of the overall prison population. Very few things fall under the category of “federal crime.” Outside of guns and drugs it’s very hard to get sent to federal prison. You make it sound like a pretty dinky law. Well, no, it did other things too. One big part of it was the Violence Against Women Act, which expanded the scope of laws against domestic violence. Another was the COPS program, which was designed to try to get state and local governments to hire an extra 100,000 police officers nationwide. It also abolished Pell Grants for prisoners. And then in terms of state prisons, the most potentially important aspect of the law was the truth-in-sentencing grants, which authorized something on the order of $10 billion to give to states that adopted very restrictive parole rules, though less than $3 billion was awarded in the end. How did the truth-in-sentencing provisions work? They said that for certain violent felonies, you had to serve at least 85 percent of your sentence before you could get parole. The feds basically offered states millions of dollars if they were willing to making it harder for people to get parole or early release. And the money was to be spent on expanding prison capacity for the expected increase in incarcerated offenders. In many ways, I think the truth-in-sentencing part of the 1994 law highlights the weakness of federal criminal policy. The feds can never tell the states what to do—all they can do is either offer them cash or threaten to withhold cash they’re already giving them to try to induce them to take certain actions. It’s very hard for the federal government to tell the states, “You must change your sentencing laws.” They can only try to sort of bribe them. And states regularly ignore these incentives. OK. So if we’re trying to determine how much blame the Clintons deserve for mass incarceration, it seems like the central question should be about the actual impact of the 1994 law. Intuitively, it sounds like it would result in more people going to prison for longer periods of time. But let’s break it down into component parts. Did the number of people convicted of felonies every year go up? I wish I could tell you the trend in conviction rates, but we have incredibly limited data on prosecutorial outcomes. We don’t have a good national data set at all on conviction, which is a pretty shocking and unacceptable gap in our data on criminal justice. What we do have is some data on how many felony cases were filed in state courts. And the number of felony cases filed in state courts rose by about 10 to 20 percent between 1994 and 2000, and by about 40 percent between 1994 and 2008. What about the number of people being sent to prison every year? 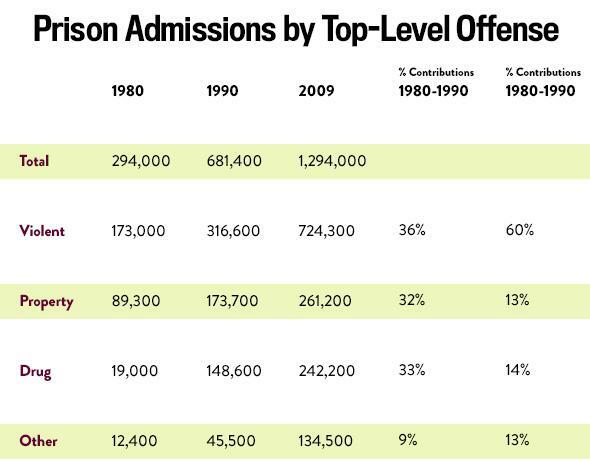 Admissions to prison go up during that time as well: From 1994 to 2000, annual state admissions rise from about 514,000 to about 618,000. And in the federal system it goes from about 27,000 to around 48,000. Did the average length of a prison stay go up as a result of the ’94 law? Well, contrary to what we frequently hear, once people are admitted to state prison, they don’t really spend that much time there—the median time to release is between one and three years, and that doesn’t seem to have really changed that much during this period of 1994 and 2000. That’s surprising. Why didn’t the truth-in-sentencing grants that the federal government was offering to the states result in fewer people getting parole and early release? Yeah, it is a little surprising, because you’d think states that were adopting these tougher sentencing laws and these tougher parole standards would result in a change in time served. And you’d expect that effect to come a couple of years after the ’94 bill goes into effect, which means that as you enter the 2000s, you’d expect the rate of prison growth to increase as you enter the 2000s. But it actually slows down. 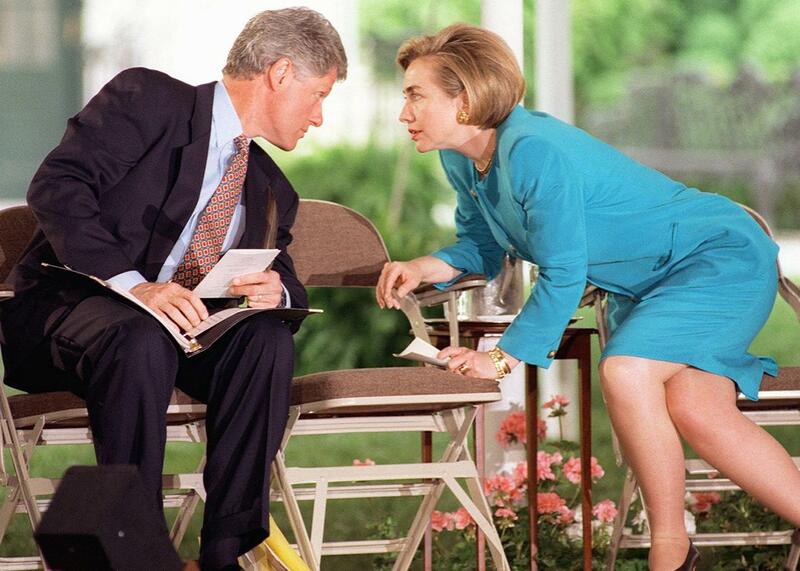 I want to go back to your first point about the growth in the prison population not speeding up under Clinton. Wasn’t there a huge crime decline that began in 1991 and shouldn’t we factor that in? Yes. Between 1994 and 2000, the violent crime rate drops by almost 30 percent, and the property crime rate drops by over 20 percent. The total number of arrests drops too. In 1994 there were a total of 14.7 million arrests, and in 2000, Clinton’s last year in office, there were 13.99 million arrests. And if we just look at serious crimes, arrests drop from 754,000 to 625,000 for violent crimes and from 2.1 million to 1.6 million for property crimes. Drug sale and manufacturing arrests—which are the drug arrests most likely to result in prison time—basically stay flat at about 330,000. Possession arrests do rise, from 750,000 to 1.25 million, but drug possession charges almost never result in prison time. So is there an argument to be made that, were it not for Clinton’s policies, the crime decline would have caused felony charges and annual prison admissions to go down during his presidency? Were his efforts to make the system more punitive just offset by the fact that fewer people were getting arrested? I’m skeptical of that. Given that prison sentences didn’t get any longer following the ’94 law, the growth in the prison population is explained primarily by a rise in admissions, and admissions are really controlled by local DAs, because they’re the ones who decide which arrestees should face felony charges. And local DAs are basically accountable to nobody, except perhaps the county electorate. Is there any reason to think that DAs started charging more aggressively because of Clinton’s crime bill? I can’t say it’s impossible, but I would be surprised. I don’t see why this bill would have changed their behavior in any real way. Other than the incentives for states to pass truth-in-sentencing laws, none of what was in the bill would have affected the states all that much. And the fact of the matter is, there’s evidence that local DAs ignore state laws too. My favorite example is that Nelson Rockefeller, when he was governor of New York, passed the Rockefeller drug laws in 1973—but the number of drug felons in New York state court didn’t move until 1984. So for 10 years you had this draconian drug law on the books, and the local DAs just ignored it. Then crack hit, and New York started sending all these people to prison on drug charges. So, if New York state DAs are more or less ignoring what Albany is doing, I can’t imagine they’re being driven that much by what D.C. is doing. Some people argue that the rhetoric around criminal justice under the Clintons created a climate in which being tough on crime was seen as normal, which contributed indirectly to the growth of the prison system. Right, so, if the Clintons had any real effect, it would have had to be more rhetorical than legal. And it’s true that Hillary Clinton’s rhetoric when it came to crime—she said that young “superpredators” had to be “brought to heel”—is profoundly troubling. It’s hard not to see a problematic racial overtone to a statement like that. But I think the question is, did the rhetoric around the ’94 act cause greater toughness at the local level, or was that rhetoric a reflection of what people were already thinking at the local level? Too often we look at what the national politicians say, and we think they’re shaping local attitudes. I wonder if it runs the other direction—that the politicians are very good at reading local attitudes and responding to them. There is some new political science evidence suggesting that congressional attitudes toward crime reflect underlying fears of crime more than they drive them. And in the early ’90s, there was still a lot of political pressure to respond to crime. But crime started going down in 1991. Shouldn’t the Clintons have resisted political pressure to make the system more punitive, if only just on that basis? Well, so, the crime bill was enacted in 1994, right? In terms of the available data, they had maybe ’92 and ’93 to look at, so that’s only one or two years into the crime decline. And the thing to remember is that violent crime had dropped from ’80 to ’84, as well, and then when crack hit, it spiked again. So, yes, crime had started to drop, and in hindsight we know it was the onset of a dramatic, long-term decline. But at the time it just looked like the same kind of lull we had between ’80 and ’84. It would have required profound foresight for the Clintons to have realized in 1994 that crime was actually going down. OK. So, from everything you’re saying, it sounds like the ’94 crime bill didn’t contribute to mass incarceration in the way some people think. But when it comes to evaluating the Clintons’ record on criminal justice, isn’t it fair to hold the spirit of the law—and the rhetoric they talked used to talk about it—against them? I think that’s completely fair. And even at the time people said that doubling down on longer sentences and even more draconian punishment was not the way to address the crime problem. The federal three strikes laws, the expanded federal death penalty, the truth in sentencing grants—even at the time you could have said, “This is not great policy, and it’s not going to do what you want it to do.” But that’s different from saying that those policies actually caused mass incarceration to happen. The truth is we were well on our way to mass incarceration by that point. The trend was already set and nothing changed before or after 1994 in terms of how that trend was moving. The reason I push so hard against this idea that the 1994 act caused mass incarceration is not just a desire for historical accuracy, although I think that’s important. It’s that saying that the 1994 act caused mass incarceration seems to imply that the federal government can get us out of the problem too. If Clinton passed a law that caused this to happen, then conceivably D.C. should be able to pass a law that reverses this problem. And that’s just not right. This is not a federal issue. And to stress that the feds didn’t cause it is important because it drives home the fact that if you really want to fix it, you have to go state by state, county by county, and change state criminal codes, change DA charging practices, and change how the plea bargaining system works. Nothing can come out of D.C. that can fix this because it’s not really a fed-created problem. And that’s what really bothers me about this ’94 act narrative. By saying the Clintons caused it, it suggests whoever is president next can fix it. And that’s just not true.